An essential feature of a good household is having a good underfloor heating system. It is needless to say that in order to have a good underfloor heating system, one needs to have good quality underfloor heating pipes. Newly developed special multilayer pipes are ideal for hydronic systems. These pipes are exponentially better than the copper pipes used earlier. In such pipes the water faces comparatively less resistance and thus the system becomes smooth. These pipes are available both in metal and plastic material. The customer can choose whichever material he/she thinks is best for his/her system. Both types of pipes have a strong-built and are not prone to erosion. If they are installed properly they can last for half a century. These multilayered pipes are able to keep all the oxygen outside the pipes. An internal layer of aluminium stops the oxygen from getting inside. These pipes are very easy to install. They are highly flexible and can bend wherever it is required. When water flows through the pipes, no noise can be heard from outside. The pipes are equipped with good noise insulation. Tiles work better with the system than carpets or timber floors. 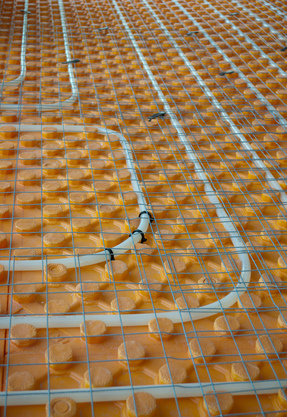 The best measurement of a multilayered underfloor heating pipe is approximately 16mm. The distance between two pipe clips should be at least 1 meter. The best type of insulation for such pipes is polyurethane. It brings the best performance out of the pipe. The pipes should be laid out at an approximate distance of 200-300mm depending on the type of insulation. In order to transfer the heat better, tiles should be used on the floor. Tiles work better with the system than carpets or timber floors. While laying out the pipe internal walls will come after the cold spots in the external walls. The distance between the external wall and the pipe should be at least 100mm. Underfloor heating systems do not clash with the usual radiator system. In small areas, such as bathrooms and WC, more heat needs to be generated. The temperature in the return pipes should be 5-10o c than that of the flow pipe. Options are available the control the temperature of each room individually. Before using, the pipes should be checked for leaks. If such details are taken care of the heating pipes function excellently. Heating pipes work well with both hydronic systems and electric systems.